Chocolate, Honey, and Oats come together to form a sweet, healthy, and filling snack. 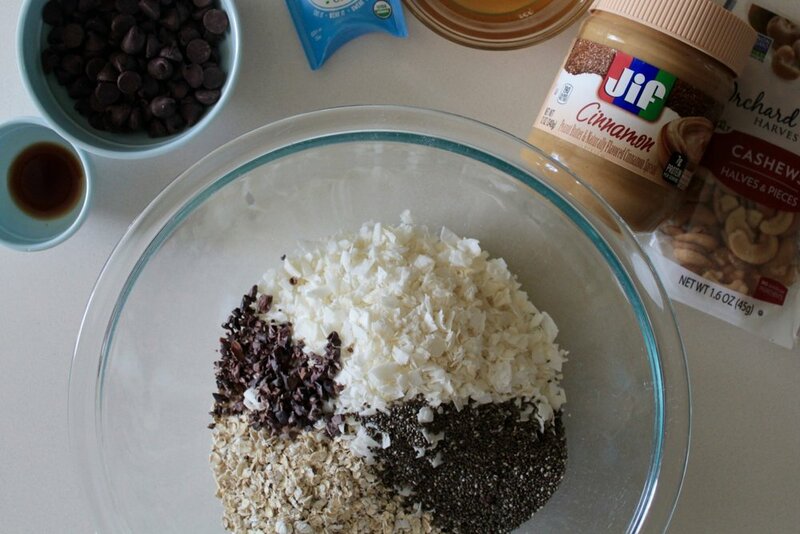 Mix the following dry ingredients well in a medium bowl; oats, coconut flakes, chia seeds, chocolate chips. Mix in peanut butter, honey, coconut oil, and vanilla extract until the mixture looks evenly distributed. Let mixture set up in the fridge for 1/2 an hour. Roll into 1" size balls *and optional roll in chopped cashew nuts. Store in an air tight container in the fridge. Enjoy as a quick snack out the door, or a post-hike treat!